Come Nov. 7, Macon County, Ill.’s county government could be getting a SMART influx with two candidates with Transportation Division ties seeking office in the Nov. 6 elections. Lloyd Holman, a member of the SMART TD Alumni Association, is seeking a seat on the Macon County Board in his first run for office. Lloyd Holman, a SMART TD Alumni Association member, is seeking a seat on the Macon County (Ill.) Board. He said he decided to run in November 2017 after receiving requests from Macon County board members and other community leaders. “Although I have never considered myself a politician, apparently others feel I could make a positive contribution,” Holman said. As the LCA 453 legislative representative for nearly three decades (1983-2011) and a former Illinois State Legislative Board chairperson for 16 years, Holman has said his experience with UTU/SMART TD helped to lay the groundwork for his run. Holman said the Macon County board chairman even helped to circulate his nominating petitions while Holman was incapacitated briefly during recovery from neck surgery. That support has extended to his campaign, where he’s received support from his union brothers and sisters. He encourages union brothers and sisters to get informed on the issues that matter to them and get involved by voting and campaigning if possible. “Remember that voting is a right and a privilege,” he said. Also running in Macon County, Ill., is April Kostenski, wife of SMART TD member David Kostenski, who is treasurer of Local 768 (Decatur, Ill.). April Kostenski, the wife of SMART TD Local 768 Treasurer David Kostenski, is running for Macon County, Ill., treasurer. With three years’ experience as a treasurer for the Macon County Democratic Central Committee, April chose to seek the county government post. The mother of 14-year-old son Dawson and 12-year-old daughter Olivia said the time factor is a big challenge in running the campaign she wants to run. “Sometimes I just need more hours in a day!” she said. However, SMART TD has helped by providing support to her campaign. Kostenski encourages SMART TD members and their families to get involved, volunteer and know their candidates as the election approaches. State legislative boards are great resources to provide information about candidates and donations to the UTU Political Action Committee helps candidates such as April make their runs for local office, she said. And lastly, members need to show up Nov. 6 or beforehand. “Every vote counts and makes a difference where you live,” Kostenski said. Right next door in Indiana, Jessica Bailey is seeking the office of Porter County clerk. 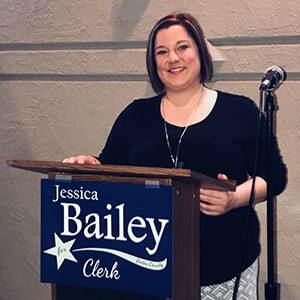 Jessica Bailey, wife of SMART TD Local 1383 Legislative Representative Ryan Bailey, is running for clerk in Porter County, Ind. The wife of Local 1383 (Gary, Ind.) Legislative Representative Ryan Bailey, Jessica is on the Portage Township school board. Ryan Bailey is a 14-year railroad veteran who works at Canadian National’s Kirk Yard in Gary and is secretary on the SMART TD Indiana State Legislative Board’s Executive Committee. Jessica and Ryan live in Valparaiso, Ind., with their two children, Bryce, 17, and Emma, 14. To read more about candidates with a TD connection and other election news – including our national endorsements – check out the October issue of the SMART Transportation Division News, available online now and coming soon to your doorstep.